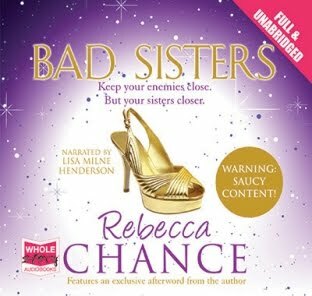 Last December, I was lucky enough to win an audio-book copy of "Bad Sisters" by Rebecca Chance on Facebook. I hadn’t read any of Rebecca’s novels previously, and I hadn’t listened to an audiobook since I was a child! I was definitely intrigued to see whether I would enjoy an audiobook as much as the ‘real’ thing. So this review is as much about my experience of an audiobook as well as the story itself. I recently got an iPod shuffle; thanks to a few technical hitches (i.e. I couldn’t stop it from shuffling!) I enjoyed some early chapters of this novel several times over; it definitely gave me a solid grounding in the three very different sisters involved in this novel even if I wasn’t quite sure where I was in the story! I soon transferred the files over to a walkman instead and started again! I listened to the 16 hours or so of audio when I was walking my dog, working out at the gym, walking to and from work and traveling on trains. I probably looked a bit strange at times as I definitely smiled a lot. There was a moment when I was sitting on a train during a particular scene in the book and had to look around to check no one could hear or see what was probably a blushing face. In this respect, let me just say that the audiobook warns of saucy content, and it definitely delivers on that front! The story switches between each of the three sisters' viewpoints and the book is cleverly interjected with scenes from the past every so often, so you build up a better understanding of the ‘deadly secret’ the further you get through. The three sisters' lives and characters were all so different and all very lavish, which allowed me to enjoy the escapist nature of the book. I also got lost in each character’s story to the point where I’d sometimes forget the ‘secret’ and yet when I was reminded of it, I was pleased that there’s an intriguing mystery that is going to come to a head at some point and I did find it gripping when it did. I think the story is designed to be a bit tongue in cheek and even though none of the sisters are that likeable as people and don’t have very high moral standards, I thoroughly enjoyed it. There’s plenty of lust in this book, and a fair amount of following that up too. It also gave a sense of how the ‘secret’ has impacted on each of the sisters and shaped who they have become as adults. I enjoyed how this aspect of the novel was explored, particularly with Devon. The audio book is narrated by actress Lisa Milne Henderson (also Rebecca’s sister). Although I can’t compare the delivery to other audio books, I loved it. The accents were great (and there are a fair few in there) and the different character voices were distinct. The pace was also just right. Lisa held my attention throughout which, I guess, is key when I could easily have been distracted by whatever my eyes were looking at! Overall, I loved this book. It's definitely for those who enjoy a ‘bonkbuster,’ but the characters are so well written, I wouldn’t want to confine it to this description alone. I’d definitely pick up another Rebecca Chance novel. Would it be an audio version? Maybe, although I quite enjoy listening to the birds again on my walks for now.